Read and see MORE ABOUT THE SCHOFIELD No. 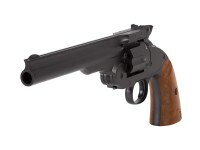 3 CO2 BB REVOLVER in Dennis Adler's latest Airgun Experience Blog. This 6-shooter is an authentic replica of the famous Schofield No. 3 designed by Army Ordnance officer, Major George W. Schofield of the 10th Cavalry. 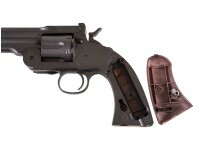 The U.S. Army ordered thousands of the Schofield No. 3, and many were used by the 4th Cavalry in the Geronimo campaign and by the Buffalo Soldiers of the 9th and 10th Cavalry. 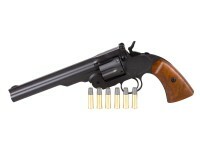 The revolver was popular among horse soldiers because of its top-break, rapid ejection system. 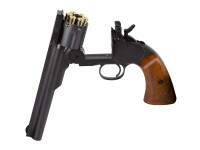 The Bear River version of this legendary gun features the same top-break design and will bring you hours of plinking fun. 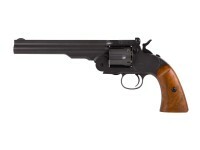 Things I liked: I own a lot of cartridge firing single action revolvers (18), plus a few CO2 versions. I've never been able to justify dropping $700 plus on a Schofield .45LC replica. 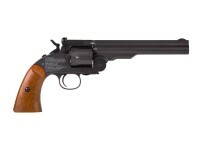 It has never had that much appeal for me compared to other six guns. I thought this would be a good substitute. I think I made an excellent choice. This piece is fantastic. I am extremely pleased with the fit, finish, and function. Everything works like it should. Accuracy is on par with my Remington and Colt BB guns. The plastic grips look like pretty realistic wood. The trigger is good, too. The price is comparable to other serious replicas. I also like the fact that it doesn't have a lot of graffiti on the side like the Remington. Things I would have changed: I wouldn't change anything about the gun. I always think these replicas would do better in a nice western styled cardboard box rather than cheap plastic blister packaging, but it is minor. The sites aren't very good, but they are like the originals. That was always a complaint about the Schofileds. What others should know: Even though there is a wrench for the CO2 tightening in the handle, I always use a separate allen wrench. I never want to risk breaking a grip. It's easier to control not over-tightening that way, too. 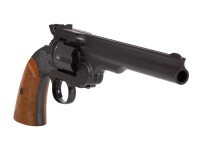 Things I liked: great accuracy for a smooth bore gun both bb's and pellets run great easy loading and a very tight action i have ssa's and some other revolvers but for an old west replica its great. Things I would have changed: A rifled barrel and pellet shells. I used the pellet shells from my webley mk4 and they worked great but the webly has a rifled barrel that makes it a little more accurate.. The manual refers to the CO2 piercing valve as a "storage valve"; what does that mean? The manual says nothing about storing with or w/o CO2. I am living in Germany, and here, Co2 Guns without the "F in a pentagon sign" are forbidden. On some pictures at the pyramydair website, there can be seen a "F" on the right side of the gun. Is this "F in a pentagon" also marked on the retail version? 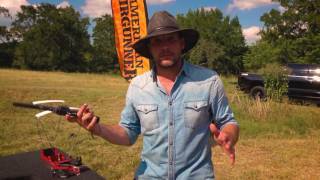 has anybody put a pellet thru one of these with the pellet shells? Better accuracy?